To continue answering the calls for Scotch and Bourbon, here’s my second ever Scotch review! 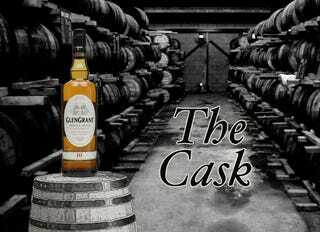 Today we look into Glen Grant 10 Year Old which is a Highlands (Speyside) Single Malt Scotch. Glen Grant is a bit of a unique distillery that uses specialized stills that are crazy tall in combination with a double purification process. They claim this helps them make an even “lighter and cleaner” scotch than anyone else. You know it’s fancy when it comes in a box. To start I’ll say that this is a Scotch to go to if you’re not into peated/smokey scotches. It’s smooth, very smooth, almost buttery. But hiding under that buttery smoothness is a touch of fruitiness. It says right on the bottle that it’ll be “Smooth, Fruity, and Rich”, but frankly I was expecting that to be marketing babble and that I wouldn’t actually taste it. I was pleasantly surprised. OK so for a Single Malt Scotch I know I shouldn’t be complaining at $39.99 a bottle. The problem is as you know a few months ago I reviewed Speyburn 10 Year. Which if you follow that link was only $30.32 (and was also fancy, it came in a fun tube). So spending almost an extra 10 bucks should get me better Scotch. But it didn’t. I’m not here to say it’s bad, it’s almost a 1. But for 10 more bucks I’m grabbing the Speyburn 10 Year every time. I’m finding as I go through more and more reviews for you guys I have a list of “go-to” recommendations. Those “Go-to’s” unfortunately set a pretty high standard in their category and Glen Grant didn’t hold up to the competition. To reiterate, it’s good Scotch and I’ll definitely enjoy it through out it’s shelf life but I doubt I’ll buy another bottle of it when Speyburn 10 Year is on the shelf just a few bottles to the left of it for less money! Honestly at $39.99 I’m almost to a bottle of Glenlevit 12 Year (around $44) and frankly I may as well buy that if I’m up in this price range. I believe if I found this bottle at the same price as the Speyburn I’d be giving it more thought and higher praise.